Figma is a cloud-based design tool that is similar to Sketch in functionality and features, but with big differences that make Figma better for team collaboration. 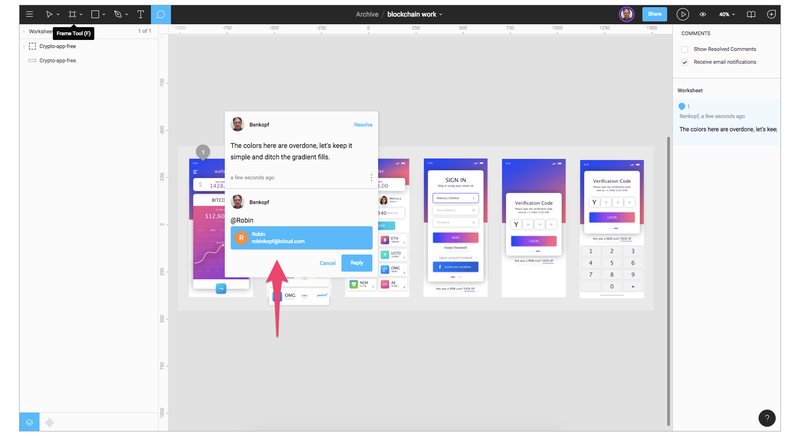 For those skeptical of such claims, we’ll explain how Figma simplifies the design process and is more effective than other programs at helping designers and teams work together efficiently. Figma has a familiar interface that makes it easy to adopt. Figma works on any operating system that runs a web browser. Macs, Windows PCs, Linux machines, and even Chromebooks can be used with Figma. It is the only design tool of its type that does this, and in shops that use hardware running different operating systems, everyone can still share, open, and edit Figma files. In many organizations, designers use Macs and developers use Windows PCs. Figma helps bring these groups together. Figma’s universal nature also prevents the annoyance of PNG-pong (where updated images are bounced back and forth between design team disciplines). In Figma, there is no need for a mediating mechanism to make design work available to everyone. 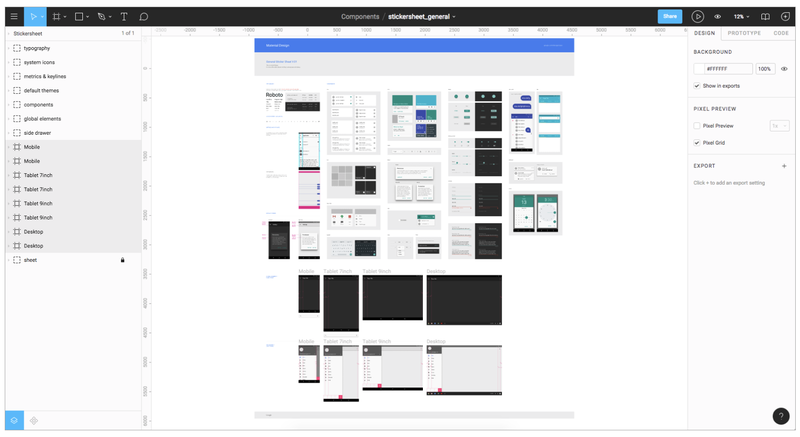 Because Figma is browser-based, teams can collaborate as they would in Google Docs. People viewing and editing a file are shown in the top of the app as circular avatars. Each person also has a named cursor, so tracking who is doing what is easy. Clicking on someone else’s avatar zooms to what they are viewing at that time. 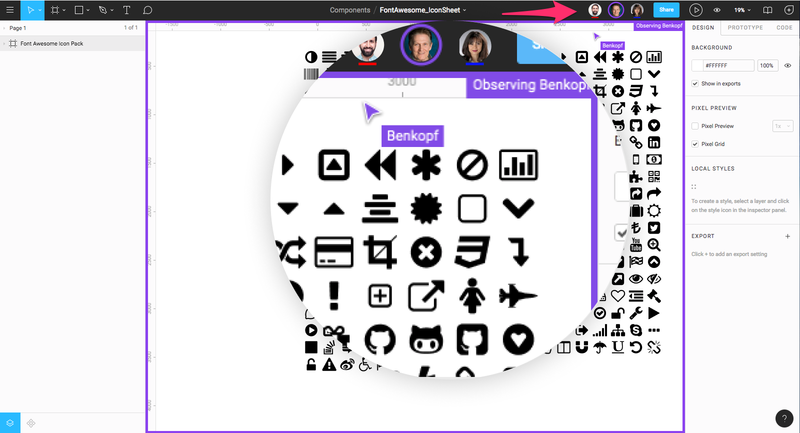 While collaborating in Figma, you can click anyone's avatar to see their view. Real-time file collaboration helps mitigate “design drifting”—defined as either misinterpreting or straying from an agreed-upon design. Design drifting usually happens when an idea is conceived and quickly implemented while a project is in progress. Unfortunately, this often leads to deviating from the established design, causing friction and re-work. Side note: Some designers don’t like to be “spied on” when they’re working, so it’s up to the design lead to explain the benefits. In general, most designers quickly see the value in such a feature and easily adapt to working in a shared environment. Figma uses Slack as its communication channel. When a Figma channel is created in Slack, any comments or design edits made in Figma are “slacked” to the team. This functionality is crucial when designing live because changes to a Figma file will update every other instance where the file is embedded (a potential headache for developers). Changes to a mockup, warranted or not, are immediately vetted, and the feedback channel is live. Figma projects can use Slack channels for threaded comments in the file. Figma also allows permissions-based sharing of any file, page, or frame (called an artboard in other design tools). When a share link is created to a frame on a page, the person clicking on that link will open a browser version of Figma, and a zoomed-in view of the frame is loaded. Figma shares projects, files, pages, and frames with anyone that has permission. This form of selective sharing, from file down to frame, lets designers, product owners, and developers share exactly what is needed in bug tracking tools and community software like Confluence or SharePoint. Figma also shares live embed code snippets to paste an iFrame in third-party tools. For example, if Confluence is used to display embedded mockup files, those files are not “updated” by saving a Figma file—those embedded files ARE the Figma file. Figma eliminates the need for dedicated apps for prototyping and commenting. Before Figma, several other tools were used to facilitate the exchange of design mockups and updates. 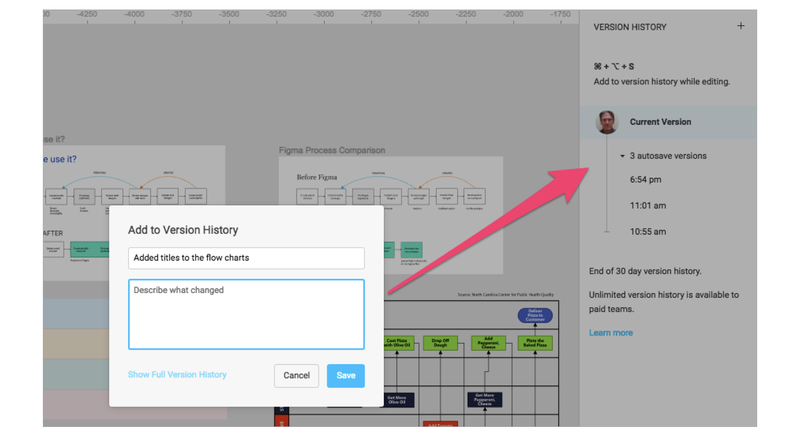 The iteration cycle was a series of back and forth file updates, so teams could review and implement the current design. After Figma, third-party tools are no longer necessary (but could be used if desired). 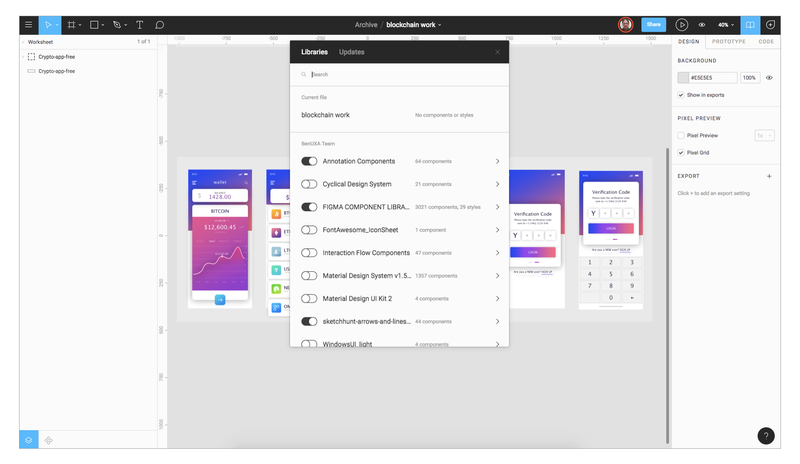 Since Figma handles the functionality of the third-party tools described previously, there is only one step in the process—move from sketches to Figma and all groups have the latest mockups. There is no “handoff” in the strictest sense of the word. Figma supports in-app commenting in both design and prototyping modes, and the comment thread is tracked in Slack and/or email. 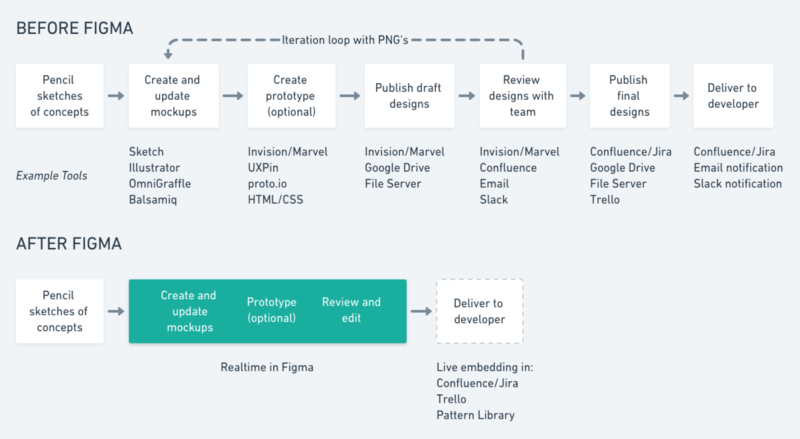 There’s no need to publish PNG files or perform constant updates to get feedback from a team using a third-party tool like InVision or Marvel. Designers can make comments during reviews by opening the same Figma file. During design reviews, team designers can discuss their work on a large screen, record comments, and fix issues—all in Figma. This form of live feedback is not possible with Sketch, which requires uploading to a cloud service to get team input. Figma displays code snippets on any selected frame or object in CSS, iOS, or Android formats for developers to use when reviewing a design file. 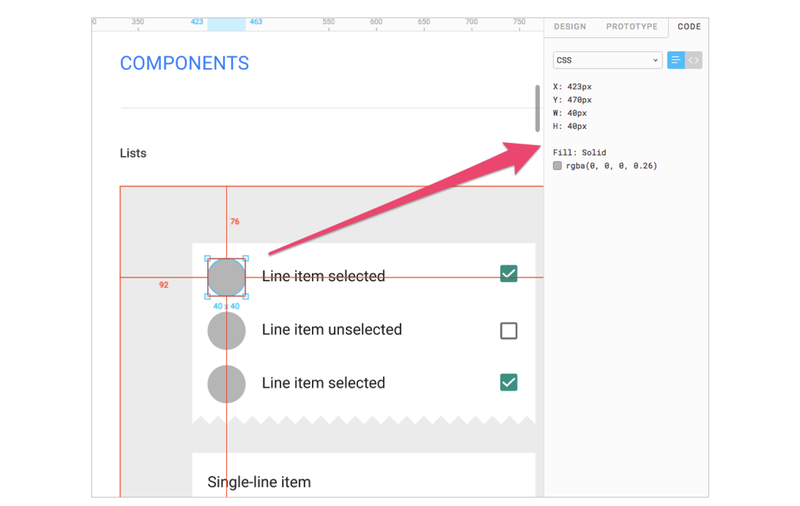 The design components can be inspected by any developer in any file they can view. There is no need to use a third-party tool to get the information. Even so, Figma has full integration with Zeplin if teams want to do more than simple measurement and CSS display. 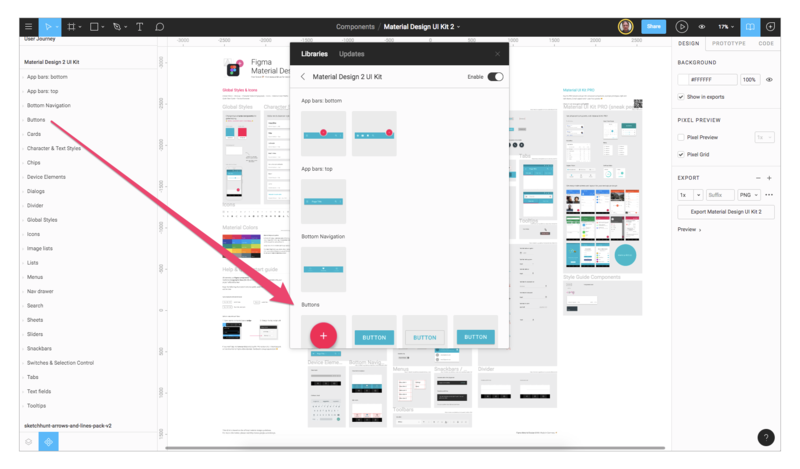 Developers can access code from the design file or by running a Figma prototype. Create a project for the feature theme. Create a file for an epic or large feature. Create pages in that file for each user story. This is just one method of organizing files that could be made more or less granular depending on what the process demands. Project files can be organized easily in a dedicated view. Figma now has developer APIs to allow true integration with any browser-based app. Companies are using this to integrate real-time displays of design files in their apps. For example, Uber has large screens displaying design files “live on air” around their company. Designs are shared, and feedback is welcome from anyone in the company. 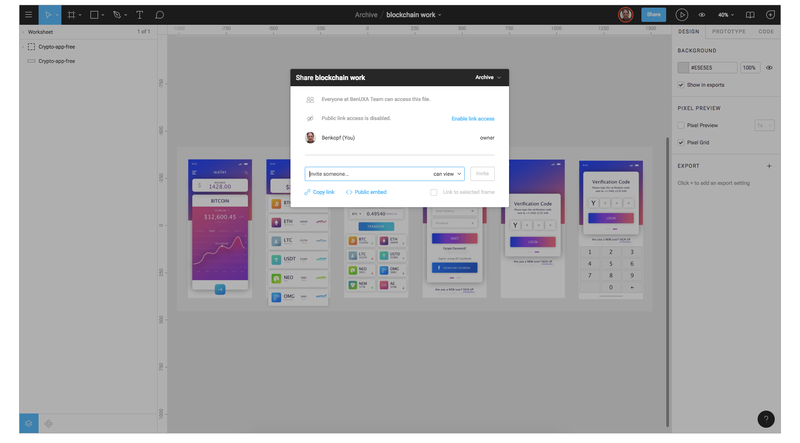 Atlassian’s JIRA software has implemented a Figma add-on so product owners, developers, and quality engineers are always viewing the latest version of any mockup from the designers. Additionally, Figma’s API promises to fulfill customer requests for third-party plugins and feature enhancements that Sketch already provides. Any uncertainty surrounding live file updating is further mitigated by Figma’s built-in versioning system. At any time, a designer can create a named version and description of a Figma file; this can be done immediately after agreed changes are made to a design. File versions are saved manually to create design branches. The live file in the shared environment will not be affected until changes are deliberately committed to the original version. It’s also possible to restore any automatically saved versions to create a duplicate or overwrite the original. While Sketch recently added artboard to artboard prototyping, Figma has gone further by providing transitions between frames. Figma’s simple prototyping feature eliminates the need for another tool that does slideshow style prototyping, such as InVision or Marvel. When all that is needed is a simple presentation with transitions, there’s no need to export to review tools. 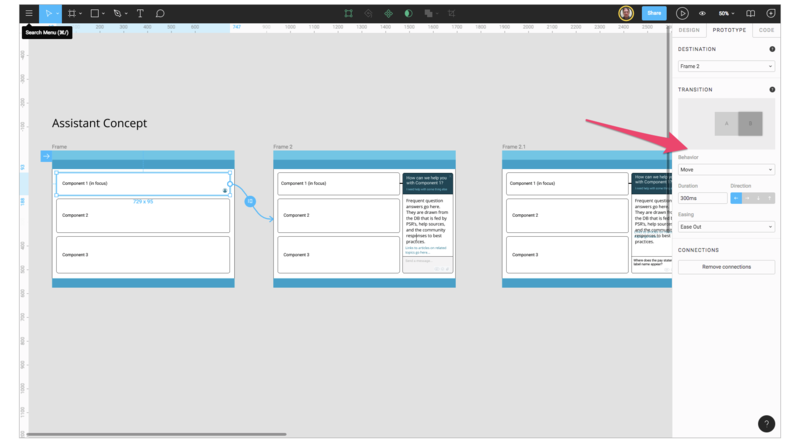 Figma prototyping works like other tools using connecting arrows between frames. 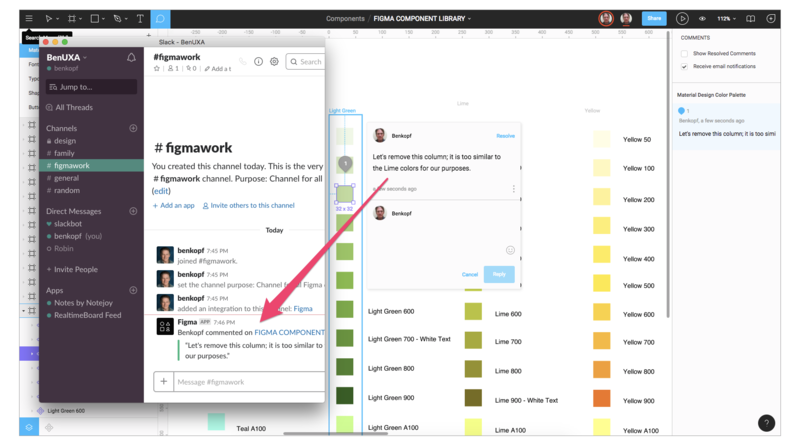 Figma prototypes can be distributed just like Figma design files; anyone with link permission can view and comment on a prototype, and again, that feedback is captured in the tool’s comment panel and recorded in Slack. Developers can see the design workflow, leave direct @messages for designers, and get measurements and CSS attributes from inside the prototype. Design systems have become a necessity for many companies, and there is a need for components (symbols in Sketch and Illustrator) that are reusable, scalable, and “tokenized” for use in the pattern libraries available to UX designers and front-end developers. Figma's team library modeless dialog gives unfettered access to components and styles. 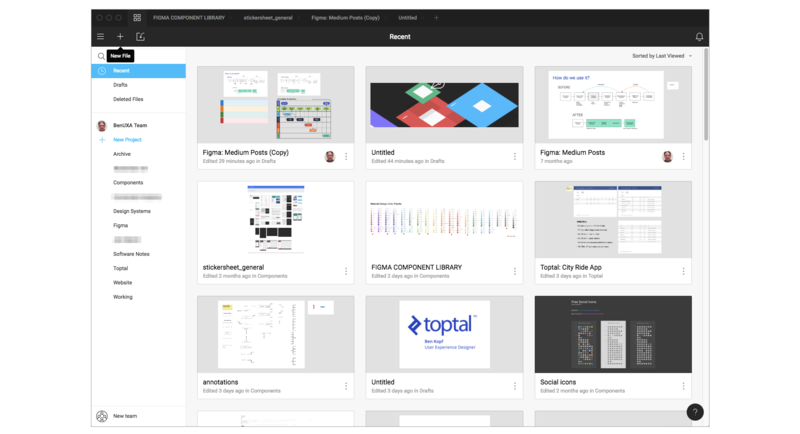 The often used phrase “single source of truth” does fit here—once a Figma team library is created, anyone with access to a project can use instances of the components in their designs and be certain they are working with the latest versions. Organizing components is simple and flexible using files and frames. Figma’s approach to component libraries is simple and easy to manage. Designers can create files that are full of components or use on-page components to organize a pattern library. Each frame in a Figma page becomes the organizational section in the team library (there is no need to create hierarchies\like\this). One way to organize libraries is to have a project dedicated solely to components. Files within that project can be organized as needed, and the pages within those files can be arranged accordingly. Using Figma for any length of time will demonstrate the benefits of this live collaboration tool. It keeps teams on task and encourages full disclosure, essential when building a design system for a variety of disciplines. Figma is easy for anyone to use on any platform, and lets teams share their work and libraries quickly. “My time spent in Figma is usually the most enjoyable and most productive part of my day” – Figma Is Transforming My Entire Workflow, and It’s Awesome! What is the meaning of collaboration tools? In design, collaboration tools help designers from different disciplines (along with developers) work together to create digital products. What is an online collaboration tool? Figma, InVision, and Marvel are all examples of online collaboration tools that designers and developers use to build digital products. Online collaboration tools allow designers and developers to edit, comment, and review designs and code together. What are the steps in the design process? The steps in the design process may vary, but in general they are: (1) define the problem, (2) perform research, (3) analyze research and brainstorm ideas, (4) develop initial solutions, (5) observe and record feedback, and (6) refine solutions and repeat necessary steps. We <3 Figma! We've evaluated several tools and tested the workflows. From creating wireframes, sharing wireframes, creating design documentation (via comments), presentation mode, prototyping, and receiving comments. Sketch is great, without it, there's no UX Tooling Revolution that's happening today. However, it does have areas of improvement. Sketch limitations for us include, it's only available for Mac users. Another limitation is the dependency on InVision to share the files and comment on them to document your designs. However, this breaks when you upload the newer versions of your prototypes, and that's a big no-no for us, as embedded design documentation has helped us very well in the past. InVision is trying to address these problems via InVision Studio, and that means it will compete directly with Sketch (traitors! lol). And I'm assuming that Sketch is creating an alternative solution that solves team collab problems? IN SHORT: Everyone is wanting to become like Figma. Yes, the world does not stand still. There are more and more cool programs and applications that accelerate and facilitate the work of the designer. And figma is one of them. The developers were not too lazy and added many different "buns" for users. Thank you very much for this informative description. It was interesting, in the case, briefly. Figma most definitely has some great powerful resources and tools inside of it but the one thing that I have noticed about designing is that we have to use the tools that work best for us. Now sometimes it is that we have to use tools that are best for the client we are working with. I personal feel that the different design tools I use need to have a clean and up to date UI or I find myself not being inspired then I go into the deep intricate things like, how does it mask different shapes? How well does pen tool work? How easy is it to export, share prototype etc. But i must admit I love some of the features you do get with Figma. Ben has 25 years of experience helping people interact with software in user experience (UXD), interaction (IxD), user research (UXR), and user interface (UID) design. He is personable, team-oriented, a process improver, passionate design tool explorer, and design system fanatic. He is a champion for the people confused by the web and the software they have to use every day. Ben is a forward thinker, thinking about what can be, not what is.